There are some days I wonder why I continue to be a school transportation director. There’s certainly not a long line of applicants for the job. I usually quickly put those thoughts out of my mind and get to work providing service for students and their parents. Frequently this means dealing with angry and upset parents, irritated administrators, and frustrated staff. On those days I console myself in the firm belief that I am making a difference in the lives of students. Last Friday was one of those days. A brief perusal of my calendar presaged the tedium of multiple meetings punctuated by the occasional “customer service” call. 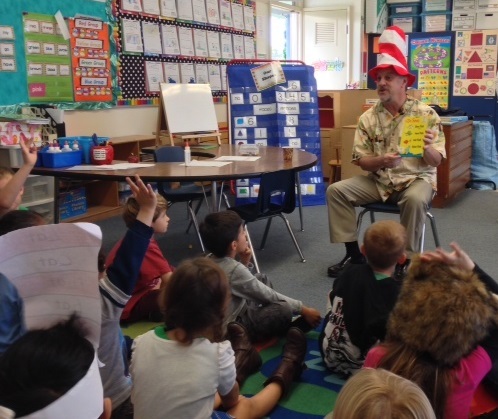 Not realizing that the day would turn out to be so busy, a couple of weeks earlier I had agreed to visit one of our elementary schools to read to students during Literacy Week. When I arrived at the elementary school, I was greeted by an office manager who genuinely seemed to be glad that I was there. She steered me back to the teacher prep room where hot fresh coffee and “munchies” were available. The coffee addict’s vacant stare I exhibited so obviously must have clued her in to my desperate need. After imbibing some liquid caffeine I was much more ready to take on the rest of the day and a group of kindergarteners who were awaiting me. I had planned on reading Yertle the Turtle from my son’s (unused for 20 years or so) Six by Seuss reader. I have an affinity for this story which tells about a king’s greed and his eventual comeuppance. However, the principal pointed out that One fish, Two fish, Red fish, Blue fish would be much better for this audience. The kids wer e all seated on their reading rug when I arrived. They loved to hear the story and were anxious to interact about a variety of topics including, of course, school buses. I left the school that day so fully recharged that I didn’t even touch the gift bag of nuts. Nothing was going to faze me for the rest of the day. I drove away with a sense of awe at the fantastic job the principal and teacher performed creating such a comfortable, learning rich environment. Yet I was also jealous of their opportunity to do so every day. If you haven’t done so recently, try taking a half hour out of your busy day and visit your local school. I think you’ll be amazed at the student creativity, curiosity, and intelligence you’ll witness. If you’re anything like me, knowing that you get to help facilitate that should be enough to keep your battery charged for a long time. Posted on March 21, 2014, in Modern Life and tagged Dr. Seuss, Education, Perspective, Students. Bookmark the permalink. 3 Comments. I certainly can understand your day and the need for the recharge. I have often found being at emergency evacuation drills and watching the adorable Pre-K kiddos attempting to fly out of the back of the bus instead of sitting and sliding just the punch in the arm I needed. Makes us realize what it is all about! Thanks Marisa. Face it; our jobs are pretty high-stress. We need to remind ourselves (and each other) frequently about why we do it. find this matter to be really something that I feel I’d by no means understand.